Intel Celeron, Pentium III FC-PGA, VIA Cyrix III. 2 more can be added as option! 3x DIMM Slots for SDRAM. 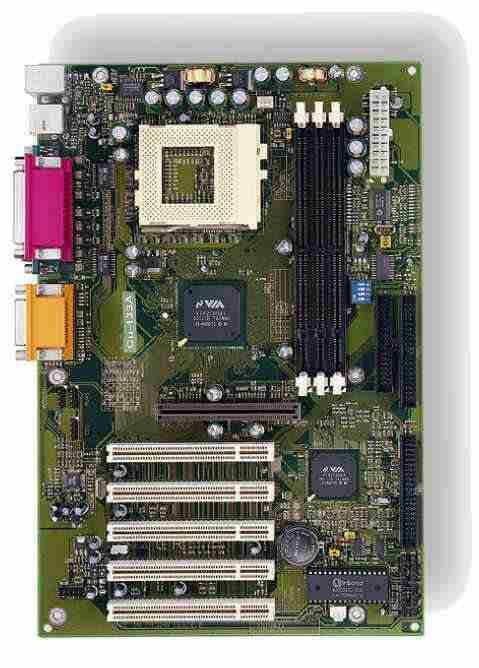 5 (32-bit) PCI, 1 AGP slots. AGP supports 1x, 2x, and 4x modes. Dual full duplex Direct Sounds channels. H/W SoundBlaster Pro DOS Legacy compatible. Supports exclusive USDM (Unified System Diagnostic Manager) under Win9x/NT4 and Hardware Monitoring Function by VT82C686B. Supports exclusive KBPO (KeyBoard Power On). Support CPU Clock Setting via Jumper Supports. USDM, WOL, AC97 audio, AGP 4X mode.